A Licensed Operator is an individual holding any local title, designation, or job description who is on-site at a Industrial Wastewater Treatment System (N License), Public Wastewater Collection System (C License), Public Wastewater Treatment System (S License), Public Water Distribution System (W License), Public Water Treatment System (T License) or Very Small Water System (VSWS License) a significant amount of time, although not necessarily full-time in all cases, and who has an active involvement in and is responsible for the operation, maintenance, and effectiveness of the system and who holds a license equal or superior to that required for the system. Becoming and continuing to be a Licensed Operator in New Jersey requires training, passing an exam, and completion of continuing education. This is managed through the Board of Examiners and the Advisory Committee on Water Supply and Wastewater Licensed Operator Training. The Board of Examiners assists the Department in the preparation, administration and scoring of examinations for operator licensing. The Advisory Committee on Water Supply and Wastewater Licensed Operator Training advises the Department through the Board of Examiners on such matters as are referred to the Committee by the Department or Board with respect to the instructional process leading to State licensing of system operators and for the further educational advancement of licensees; coordinates the activities of New Jersey educational institutions offering or proposing to offer appropriate coursework; establishes and periodically updates standardized course outlines for the educational training of the operators of water supply and wastewater facilities leading to State licenses and specifies a minimum number of classroom hours for each; periodically reviews available textbooks in the field of water supply, water treatment and wastewater treatment, and makes recommendations for standard textbooks which should be used for approved courses; acts as a clearing house on matters affecting water supply and wastewater licensee training in New Jersey; and reviews and makes recommendations to the Department regarding seminars, workshops, training courses, college courses or other means, which are acceptable as credit toward training contact hours for license renewal. How often are the examinations given? Can you apply for more than one exam on the same application? How does an individual become certified? What is direct responsible charge experience? How do I apply for an examination? Can I apply for more than one exam in the same exam cycle? I work at a utility that has multiple water and/or wastewater facility classifications. If I have one year total operating experience, does that satisfy the experience needed to qualify to take multiple examinations (e.g., both treatment and conveyance, or both water and wastewater treatment, etc.)? After taking an exam, how will I be notified of the results? Does New Jersey grant reciprocity to out-of-state license holders? Can I pay my renewal fee online? What courses are acceptable for operator license renewal? *How can I find out how many Training Contact Hours (TCHs) I have received and how many are needed for license renewal? *Who do I contact if I was not credited for Training Contact Hours (TCHs)? How do I notify DEP that I will no longer be serving as the licensed operator in charge at a system or that I am the new licensed operator at a system? I have completed the required training course(s) to be eligible to sit for an examination. Am I eligible for reimbursement by the DEP? I want to become a training provider of water/wastewater related courses. How do I obtain approval from the DEP? *As a training provider how can I verify my courses and associated rosters have been entered in your system? *As a training provider who do I contact if my courses and rosters have not been entered or the information is incorrect? How can I look up the license information for a water and/or wastewater system operator? 1. How often are the examinations given? Examinations for Water/Wastewater Operators are given three times a year in March, June and October. 2. When are the application closing dates? The application closing dates are January 15th for the March examination, May 1st for the June examination and September 1st for the October examination. Applications must be posted-marked by the closing dates. 3. Can you apply for more than one exam on the same application? No, you must submit a separate application for each license type applied for, you must have an updated Statement of Qualifications for each license type. 4. Can I reschedule my exam? Yes, examinations may be rescheduled only for extreme emergency situations, please send a letter or fax a letter to our office stating why you couldn't make the exam and that you wish to be scheduled for the next examination. Fax # (609) 292-1308. 5. How does an individual become certified? 6. What is operating experience? Operating experience means the time spent in the satisfactory performance of operational duties at a system which is acceptable to the Board of Examiners, who review exam applications on behalf of DEP. For an industrial wastewater treatment system (N) license, manufacturing and process experience may be acceptable in lieu of operating experience. 7. What is direct responsible charge experience? Direct responsible charge experience means active, daily, on-site supervision, including operation and maintenance responsibilities in a system with a classification no less than one classification lower than the license sought. This experience shall be gained while in possession of a license no less than one grade lower than the license sought. 8. How do I apply for an examination? For T, W, S, C, N, or VSWS license(s) complete Examination Application for License to Operate (Form #ADM-035) and the accompanying Statement of Qualifications (Form #ADM-035A). Include documentation of High School Diploma and completion of necessary training courses. The statement of qualifications must have an original signature by the appropriate signatory. The appropriate signatory is typically the licensed operator in charge at the system but in some cases may be the system owner or administrator. Also include the necessary application fee. Applications submitted without the appropriate documentation and/or nonrefundable fee will be returned without substantive review. Applications must be postmarked or hand-delivered to the Bureau of Licensing & Registration no later than January 15 for the March exam, May 1st for the June exam, and September 1st for the October exam. 9. Can I apply for more than one exam in the same exam cycle? You may apply for multiple exams in the same exam cycle. However, you must submit a separate application and a separate application fee for each license type, and all individual applications and fees must be sent in one package. You must use the same Statement of Qualifications for all exam applications, indicating the appropriate percent of time for each of your job duties. The Board will immediately reject all applications in which there is inconsistent information presented on multiple applications. Exams have a 3 hour time limit. Because of how exams are administered in accordance with this time limit, applicants may take no more than two exams per day. Therefore, if you are approved to take more than two exams in the same exam cycle, third and subsequent exams will be scheduled on different day(s). 10. I work at a utility that has multiple water and/or wastewater facility classifications. If I have one year total operating experience, does that satisfy the experience needed to qualify to take multiple examinations (e.g., both treatment and conveyance, or both water and wastewater treatment, etc.)? The Board reviews applications to determine if the applicant meets exam admission criteria on a case-by-case basis. The Board may consider the percentage of time documented for job duties in terms of relevance to each license type, with the understanding that certain job duties may be specific to one license type and others may overlap. If you have gained experience in multiple areas (e.g., treatment and conveyance) during the same period of time while employed in the same position, please specify the appropriate percentages of time in each area. Individuals must have the appropriate amount of documented experience in each area in order to be admitted to each exam. An applicant employed solely in one specific area of operations who demonstrates little or no experience in the area for which the license is sought will not be approved for admission to that exam. For this reason, particularly for class 1 and class 2 exams, an applicant employed at a smaller utility where he is the jack-of-all-trades may be better positioned to acquire the experience needed to qualify for multiple license types more expeditiously than an applicant employed at a larger utility with a more specialized job position. The latter applicant may need to serve in multiple positions in different areas of operations in order to demonstrate the appropriate amount of experience needed to qualify for multiple license types. 11. After taking an exam, how will I be notified of the results? Approximately 4 - 6 weeks after taking the exam, you will be notified if you have passed or failed. If you have passed, you will receive a bill for the initial license fee. All examinees will receive an analysis of their test results. This analysis will show the number of correct/incorrect responses in each area of the exam. No one will be permitted to review the actual exams. 12. Does New Jersey grant reciprocity to out-of-state license holders? Individuals holding licenses issued by other State(s) may apply to New Jersey’s Board of Examiners to be granted a New Jersey license. The applicant must meet the minimum NJ education and experience requirements for the license sought and have passed an examination that is deemed equivalent to a New Jersey exam. Also, New Jersey may only grant reciprocity for another State’s license if that State grants reciprocity to New Jersey licensees. Please contact the Bureau of Licensing & Registration at (609) 777-1012 if you require further information about this process. 13. How long are licenses valid? Renewal applications are typically mailed out in August each year. If you have not received your renewal application by the end of August, contact the Bureau of Licensing & Registration at once at (609) 777-1012. If a license holder fails to renew his license within one year following the renewal date of the license, he will not receive a license unless he meets the current requirements for the license and passes another qualifying examination. 14. Can I pay my renewal fee online? Yes. Go to DEP Online and select Pay for a License (listed under Non-Registered Services). You must have your invoice number, license number and credit card/checking account information available to utilize this service. 15. What courses are acceptable for operator license renewal? Only water-related courses are accepted for water licenses. 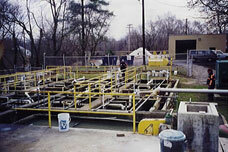 Only wastewater-related courses are accepted for wastewater licenses. Some courses may be valid for both water and wastewater licenses. Water/wastewater-related Continuing Education Units (CEUs) that adhere to the criteria set forth by the International Association of Continuing Education and Training (IACET) are accepted on the basis of 1 CEU = 10 TCHs. Training programs and courses that have been approved by NJDEP are accepted. These courses will have NJDEP course approval numbers. College credit for courses which are directly relevant to the operation, maintenance or management of a wastewater or water system and which address influences on water quality, public health or environmental protection will be issued 15 TCHs for each credit hour. 16. What are the continuing education requirements for license renewal? 17. How can I find out how many Training Contact Hours (TCHs) I have received and how many are needed for license renewal? Click here to get a report of the training contact hours that have been recorded for your license(s). 18. Who do I contact if I was not credited for Training Contact Hours (TCHs)? 19. How do I notify DEP that I will no longer be serving as the licensed operator in charge at a system or that I am the new licensed operator at a system? Complete and submit the DEP-065 form “Licensed Operator in Charge Employment Notification Form (Water) or the DEP-065 form “Licensed Operator in Charge Employment Notification Form (Wastewater) to the Bureau of Licensing & Registration. The form must be completed and signed by both the licensed operator and the system owner or administrator. Licensed operators shall notify DEP at least two weeks prior to changing positions or employment. The owner of a system employing a new licensed operator shall notify DEP within two weeks after the licensed operator begins his/her employment. 20. I have completed the required training course(s) to be eligible to sit for an examination. Am I eligible for reimbursement by the DEP? Please refer to either the fact sheet for water or wastewater to see if you meet the eligibility requirements. If you do, then complete the appropriate application form BSDW-OC-01 or DEP-125 to submit the reimbursement request. 21. I want to become a training provider of water/wastewater related courses. How do I obtain approval from the DEP? Complete and submit the TCH provider application package. 22. As a training provider how can I verify my courses and associated rosters have been entered in your system? Click here to get a report of the training contact hours that have been recorded for your organization. Click here to get a report of the training contact hours that have been recorded for your organization with the rosters. 23. As a training provider who do I contact if my courses and rosters have not been entered or the information is incorrect? 24. How can I look up the license information for a water and/or wastewater system operator? Click here to get a report all water and wastewater license holders which includes information on what license(s) they currently hold.